With the Katipunan now well organized, Bonifacio turned his attention to the symbol of its authority. Upon his request, Benita Rodriquez with the help of Gregoria de Jesus, Bonifacio's wife, made a flag. It consisted of a red rectangular piece of cloth with three white K's arranged horizontally at the center. This was the first official flag of the society. But some members of the Katipunan has their flag with the three K's arranged in the form of a triangle. Bonifacio himself has a personal flag which consisted of a red rectangular piece of cloth at the center of which was a white sun with an indefinite number of rays. Below the sun were the three white K's arranged horizontally. Owing to the lack of uniformity in the design and use of the flag, some generals of the revolution adopted their own designs. Thus General Mariano Llanera used a black banner with a skull above two cross bones and the letter K, all in white. So different was this banner that Bonifacio humorously called it "Llanera's skull." Still another flag was that of General Pio del Pilar which consisted of an equilateral triangle with a K at each angle. Inside the triangle was a mountain with the sun rising behind it. When the revolution flared up, the Magdalo faction of the Katipunan in Cavite adopted a flag consisting of a red rectangular banner with a white K in the ancient Tagalog script in the center of a sun, represented by a white circle, with an indefinite number of rays. Later on, the rays of the sun were limited to eight to represent the eight provinces which first took up arms against the Spaniards. This flag became the first official banner of the revolutionary forces and was blessed in a mass celebrated at Imus. In the Naik Assembly of March 17, 1897, the Katipunan military leaders decided to adopt a flag with a new design. It consisted of a red rectangular cloth with a white sun and rays in the middle. The sun was the mythological sun with eyes, eyebrows, nose and mouth. This flag superseded the flag of the Magdalo faction and became the first official flag of the Filipinos. It became the symbol of the Filipino nationality until the signing of the Truce of Biyak-na-bato on December 14-15, 1897, when it was hauled down from the pole of the revolutionary headquarters at Biyak-na-bato. During his exile in Hongkong in 1897, Gen. Emilio Aguinaldo designed the Filipino flag as it looks today. 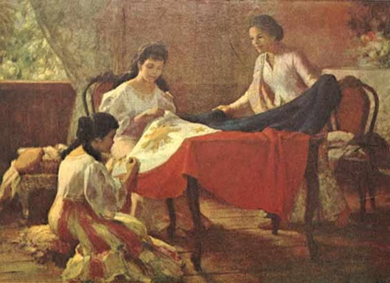 The flag was sewn by Dona Marcela Marino de Agoncillo with the help of her daughter Lorenza and Mrs. Delfina Herbosa de Natividad (niece of the Philippine National Hero - Dr. Jose P. Rizal). It was first raised during the declaration of Independence on June 12, 1898 in Kawit, Cavite. It was made of silk with a white triangle containing a sunburst of eight rays at the center, a five-pointed star at each angle of the triangle, a blue field and a red field. The white triangle stands for equality and fraternity; the blue field for peace, truth and justice; and red field for patriotism and valor. The eight rays of the sun stand for the first eight provinces that the colonizers have put under martial law. 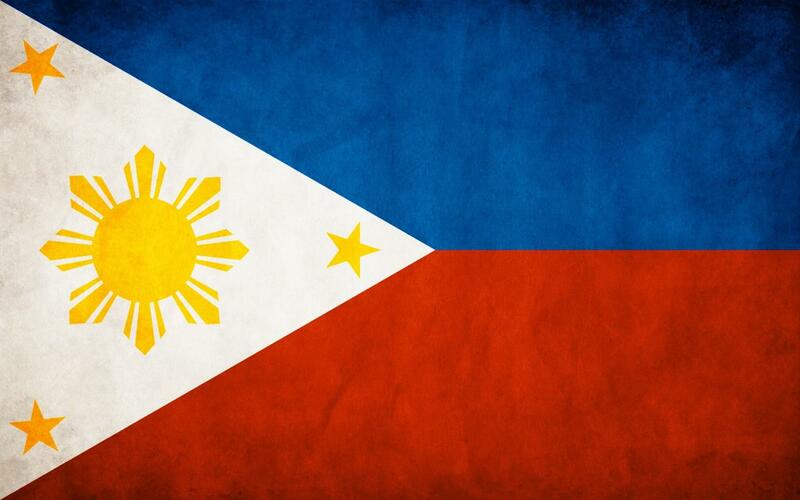 The three stars symbolize Luzon, Visayas, and Mindanao.